On November 1, 2001, the National Weather Service (NWS) implemented a new Wind Chill Temperature (WCT) index, designed to more accurately calculate how cold air feels on human skin. The former index used by the United States and Canada was based on 1945 research of Antarctic explorers Siple and Passel. They measured the cooling rate of water in a container hanging from a tall pole outside. A container of water will freeze faster than flesh. As a result, the previous wind chill index underestimated the time to freezing and overestimated the chilling effect of the wind. The new index is based on heat loss from exposed skin and was tested on human subjects. 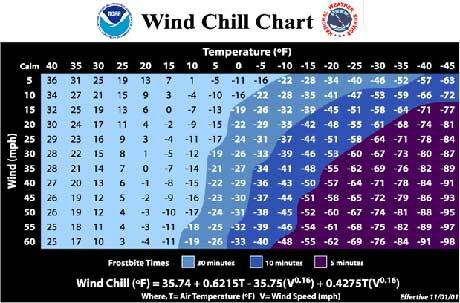 For the first time, the new Wind Chill Chart includes a frostbite indicator, showing the points where temperature, wind speed and exposure time will produce frostbite on humans. The current formula uses advances in science, technology, and computer modeling to provide a more accurate, understandable, and useful formula for calculating the dangers from winter winds and freezing temperatures. Clinical trials were conducted at the Defence and Civil Institute of Environmental Medicine in Toronto, Canada, and the trial results were used to improve the accuracy of the new formula and determine frostbite threshold values. Standardization of the WCT Index among the meteorological community provides an accurate and consistent measure to ensure public safety. The new wind chill formula is now being used in Canada and the United States.